What You Should Expect from Your Die Caster …and how to get it! Do they deliver cost-effective solutions in the quantities you need? 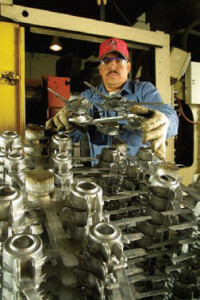 Rangers Die Casting can deliver from 100 to one million pieces a year. What are the limits of their casting production capabilities? 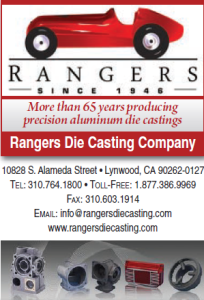 There is no aluminum die casting job too large or too small for the production staff at Rangers.We specialize in cast aluminum parts and die cast aluminum components, giving Rangers Die Casting a competitive edge over other die casting companies. Do they use x-ray technology for quality assurance? Rangers was the first and still one of the few companies in the western states that use real-time x-ray technology for ongoing quality assurance of cast aluminum parts. Our die casting company’s quality control ensures your aluminum die castings meet casting specifications. Can they meet your production deadlines? Rangers’ in-house aluminum die casting design, production and finishing ensures that orders are ready when you need them.We do our own precision machining of aluminum alloy castings, complete metal finishing and cast aluminum parts assembly to save you time. Plus, we’re close to our major customers, eliminating shipping lags that are common with offshore suppliers. Do they have the die cast experience you need? We have delivered effective customer solutions for more than six decades. A stable management team that knows the industry backs our aluminum die casting company experience.We know what it takes to produce complex die cast components and exceptional die cast aluminum parts. Do they have a “Work With” attitude? We collaborate with you to understand your needs and to develop effective solutions. Listening to your needs and understanding critical production requirements ensures long-term success and meaningful working relationships.We can help you convert existing parts from other material to cost-effective aluminum die castings using appropriate aluminum alloys. Do the bids all use the same basis? Often low bids either do not include every cost that will be incurred or they are based on lower quality methods or alloys. Make sure your bid specs are clear so that every bid can be compared on an “apples-to-apples” basis. Do the bidders’ engineering team understand your project? Rangers will meet with you and ask the right questions to gain a full understanding not only of your parts requirements, but also the end product so that we can help you achieve the quality part you need at the price you can afford.We will help you optimize your drawings for maximum performance from the parts we manufacture for you. Do your die cast bidders keep up to date with the latest technologies? 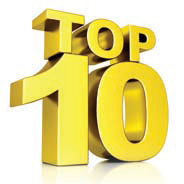 Successful companies stay on top by re-investing in the latest technological innovations. At Rangers, we use the latest advanced technology including process simulation software.We can plan for the best die design for production issues such as metal flow, air entrapment, metal velocity, and thermal balance.With Rangers, you can rely on a quality part delivered with a short lead time and produced at a competitive price. Do your casting suppliers know how to select the correct alloy for your part? Alloy selection is a key component of any die cast operation. At Rangers, you can depend on our engineers making an alloy selection that best meets the requirements of your die cast component. Make sure you select the appropriate die cast company for your projects. The cost of a mistake can be significant in terms of end product reliability and quality, production delays and cost overruns.With Rangers you can rely on our innovation, integrity, accessibility and reliability for the production of your die cast components. For your next die cast project, choose Rangers. Connie Sotelo’s 20th Anniversary at Rangers! L to R:Robert Rogers 35 years, Concepcion Sotelo 20 years, Kent Shortle 37 years, Tony Hernandez 30 years and AlfredoValdivia 43 years with Rangers = 165 years total with Rangers! 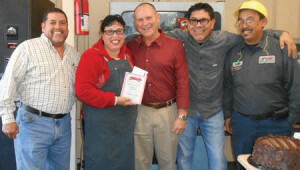 Connie Sotelo recently celebrated her 20th anniversary as a member of the Rangers Die Casting production team. She has worked in the areas of quality control and secondary operations since the mid-1990s. Her bilingual language skills and strong work ethic have made her invaluable to Rangers over the years. Company management reports that Connie is well respected and liked by everyone. Connie: We wish you continued success and happiness as you start your third decade of service at Rangers Die Casting! We operate 14 aluminum die casting cells with gas and electric furnaces so we have the capacity to handle your needs.